The story of Jonah is accurately retold from the Bible (From the book of Jonah). Illustrated by Duncan Maclaren.The Bibletime series by Carine Mackenzie have been praised for their accurate retelling of great bible stories. This timeless collection has been printed in many languages throughout the world and sold in their millions. They can be read over and over again. 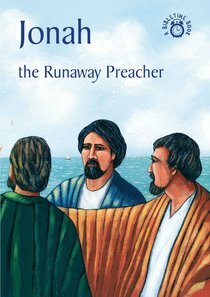 About "Jonah, the Runaway Preacher (Bibletime Series)"
These charming 32-page books take on the challenge of telling complex Bible stories in a way that is suitable for children, yet follows the original closely. With colourful, dignified illustrations, they help 3 to 8 year olds really grasp the Word of God.